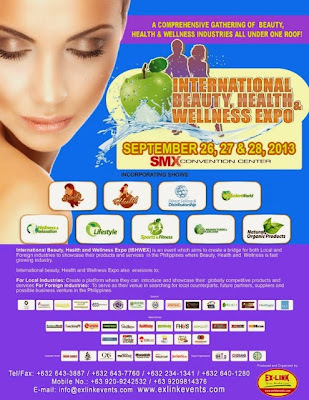 The International Beauty, Health and Wellness Show (IBWHEX) officially opens today, September 26 at the SMX Convention Center. The Ribbon Cutting ceremony was headed by the Ex-Link (event organizer)together with celebrities, media partners plus health and wellness experts from various industries. 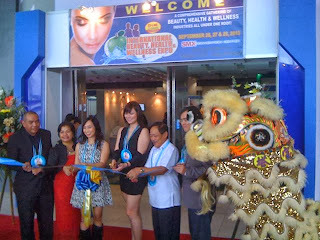 Present were Ms. Carmie de Leon (VP Sales and Marketing – Healthway Medical, Ms. Cynthia Lagdameo (President and CEO of Asian Holistic Medical Alliance, Dr. Hernando Delizo ( President – Chair and CEO – Healthcare Business Development Partners Holdings, Inc.
International Beauty, Health and Wellness Expo 2013 is aimed at creating a platform for international trade associations, manufacturer, exporters, importers and wholesalers where they can showcase and promote their globally competitive products and services. It also serves as a venue for collaboration among potential clients, suppliers and business partners for possible business ventures and find internationally competitive suppliers in the local market. According to Mitch Ballesteros, CEO of EXLink Event Management, ” The expo is also a perfect venue for international companies to gain a foothold in the Philippine market , by partnering with local companies to further their expansion efforts and business growth in the country. This can be very timing endeavor since the Association of South East Asian Nations ( ASEAN) is preparing for full integration by 2015 under a single ASEAN Economic Community". Highlight of the program is Healthway Medical's “DANCE FOR HEALTH, a healthy way to live” advocacy program that would benefit the KYTHE Foundation and CENTEX, a project of Ayala Foundation, Inc.
Kythe advocates the adoption of the Kythe Child Life Program in Philippine hospitals. Kythe was able to institutionalized the Kythe Child Life Program in 13 government and private hospitals benefiting over 8,000 pediatric patients with chronic illness through the help of partner organizations and donors such as Healthway Medical. There are over 120 booths in this exposition that showcase a wide array of health and wellness products and services. Well-known brands the ASEAN member countries are being offered under discounts so do visit this three-day expo. Avail of the various promotions until September 28, 2013. Entrance Fee is set at 50 pesos.